The following is from Marcia Douglas' novel, The Marvellous Equations of the Dread. The novel features a cast of reincarnated ancestors, including Bob Marley, in a mythical reworking of Rasta history. Marcia Douglas is an author and performer, and teaches creative writing at the University of Colorado, Boulder. 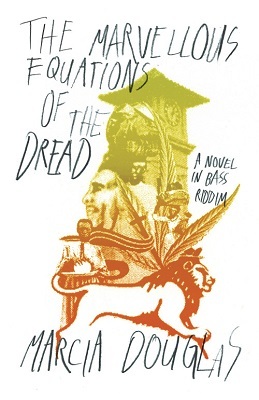 The Marvellous Equations of the Dread was longlisted for the 2016 Republic of Consciousness Prize and the 2017 OCM Bocas Prize for Caribbean Literature. The story goes that my grandfather, Hector, married Winnie, an obeahman’s daughter. Grandpa Hector was a tailor, a quiet man who liked to smoke a little herb now and then down by the river. That’s what Gran-Win told me. She said nobody knew about Hector’s herb except she. He liked to smoke while he sewed, his tape measure around his neck. He took an interest in Marcus Garvey, Jah prophet, who went to America preaching back-to-Africa and stirring up so much dust that Babylon had to devise a way to kick him out and deport him to Jamaica—mail fraud, they claimed. Hector wallpapered the two rooms in which they lived with newspaper clippings and drawings of the Black Star Line, Garvey’s ships, which would take us to Ghana. That’s what I remember most about Gran-Win’s house—the ships, and the walls covered with newspaper; it was the same house I grew up in. Gran-Win made a paste of flour and water to stick everything up; I loved her pitchy-patchy. She pasted a note to one wall along with two old calendars that advertised Murray’s Miracle Hair Pomade and Palmolive soap. The note went like this: A little Epsom salt in riverwata and a stone at the battom of the cup two night raw moon and a good night sleep on a bare mattrass see if you find . . . After that the ink was too faint to read. I loved Gran-Win’s shaky join-up writing, and always wondered what the thing was that needed to be found. Gran-Win said Grandpa Hector was the one who added a world map, some UNIA pamphlets and bits and pieces of news that had been saved in a Cuban cigar box under the bed. He drew a blue line on the map—Jamaica to Africa— and stuck a threaded needle in his destination. Gran-Win said that first thing every morning he boiled a cup of mint and drank it while studying the wall. He used a piece of magnifying glass, studying each and every one of Garvey’s words, admiring the look of Africa in print. LOOK TO AFRICA, the wall said, FOR THE CROWNING OF A BLACK KING. HE SHALL BE THE REDEEMER. One day Anjahla will tell this story to her children. It’s true Hector carried pictures of Garvey’s Black Star Line in his front pocket, but his most valued possession was his Singer sewing machine. Sometimes Winnie thought he loved the sewing machine more than her, more than his own flesh and blood. He had bought it on trust, putting five shillings in a brown envelope every month-end and paying at the post office. He was a good tailor and always had work, sewing way into the night. The sewing machine was his mistress and rum bottle. Whenever something bothered him, he turned to his machine. “Millicent,” he called her. When he stitched with Millicent he took off his shoes and socks, because he liked his bare feet against the cool iron of her peddle. It was to Millicent Hector turned when he discovered that the Black Star Line was going nowhere and that Garvey, his vision unsupported, had left for England. Gran-Win said that when Hector sang with Millie that night, his voice was wood-smoke and Job’s tears. One thousand stitch will hem a jacket, three hundred a sleeve; not that I count them, but I know them are there. A man don’t count his breath, but he know is there. I listen the stitches that way. One stitch at a time, like the words-them on the wall, one word at a time. How many words in this house? Too many to count; this house made of words. And while I stitch I breathe and while I breathe I sing. Breddren and sistren, I pass through some things in life. When me was a boy, my eyes at my knee, my mother put me on a bus and send me to Spanish Town to spend time with my uncle and learn to sew. When I get off the bus it was night and nobody to meet me. I wander three days and three nights before I find my uncle yard. When I reach the house, I find him dead at his sewing machine, black fly already at his mouth-corner. But the thing about his mouth that I always member was the smile. He dead with a smile on his face. True that. I’m a man don’t fraid death, for the first dead I see had a smile on him face. Now, because my uncle dead, is me teach meself how to sew. One stitch at a time. That’s how I learn it. Anything you want learn, you can learn it one thing at a time. One-one cocoa fill basket. I love to sew because it mellow me. And the herb too. It mellow me. If it wasn’t for the sewing and the herb, I would be a different man—because I go through some things, I tell you. My wife, Winnie, the obeahman daughter, she can tell you. Her father set duppy on me because him never want me marry her. But me know Winnie was to be my wife from me was fourteen years old. Me see her a catch water by the river and me see how she set the pan on her head and hold her neck high, her neck so long and straight and pretty make you want kiss it. I used to walk behind her, just so I could watch that neck—and her bottom when she walk. I never realize her father—Bro. Mo—see me watch her from his corner-eye till, one night, him send the duppy of one of them old-time overseer to whip me. The overseer duppy whip me and whip me just like times of slavery. And when him whip me, him say, Who do you love? His voice big and boom. And I say, Winnie. And him say, Who do you love? And I say, Winnie. And still him don’t stop till one night something come to me and I say, Long live the Queen, Sar. And then him let me go. In the morning, not a sign on my back. I get to find out that the overseer was a man used to name Brighton. He was an Englishman on a plantation in Clarendon—but what in them times they used to call Vere. After his wife dead of dengue fever, he go mad and turn blame on Jamaica, and he whip every last slave, every Jack man, woman and child out their bed—5 people dead that night—then he hang himself on a stinking toe tree. Some night when Brighton whip me, my mother stand in the doorway, watching me bawl, but she couldn’t do a thing. And when I can’t take it anymore I say, Long live the Queen, Sar, and sometime him stop and sometime that don’t satisfy neither. On those nights, I have to salute to every duke and duchess and lord and lady, and puss and dog go straight back. You never see Brighton, you know, you only hear the whip and his voice rolling like a three-wheel mill. But my mother knew it was Bro. Mo set Brighton on me, but she couldn’t do a thing. No matter where I go, Brighton follow me. Even after Bro. Mo dead and I marry Winnie and in bed with my wife as a man ought be, Brighton still cast his whip on my back same way. Sometimes I so shame, I don’t want Winnie know say Brighton down on me with his whip, and when I cry out I make her think is she and her sweet why I holler. For we fight not against flesh and blood, but principalities and powers. Is there a balm in Gilead? Then the thought came to me that if I could go Africa, Brighton could never follow me there, and that’s when I hear about Marcus Mosiah Garvey and his ships to Zion. But Garvey’s Black Star Line went broke and the ship, old and leaky-leaky, never made it to Africa at all. Second chance came on a sticky afternoon when Gran-Winnie met a man at a standpipe by the road as she waited for slow water to fill her cup. He said his name was Leonard Howell. He had quick, intelligent eyes, and a beard alive with natty hair; he gave her a postcard of His Imperial Majesty, Haile Selassie I, Emperor of Ethiopia. “Wake up and live,” Mr. Howell said; then he was gone. The emperor in the photo was handsome with his crown and velvet robe; Winnie had never seen a black king before. With his arch eyebrows and long nose, he looked like Uncle Lloyd on her mother’s side. She ran home to Hector—“Come see a man!” She had found the king prophesied in the writing on the wall. Rumour had it that the emperor’s photo was good for passage on a ship back to Africa. Hector arrived at Kings Street Wharf on October 14, 1934 with the postcard from Howell, a suitcase containing a change of clothes, five pounds in his pocket and the brown fedora he had crossed sea in as a newborn. He was going to Africa. He would send for Winnie and the children once he got settled. The dock was scattered with men just like himself; most of them beardsmen—they called themselves Rastas. They had all felt Ethiopia in their marrow, paid their shilling and answered the call. But passage to Africa was nowhere to be found and when the authorities came, it was clear that no one would be leaving for Ethiopia that day. Bit by bit the men dispersed. Hector alone sat on the dock until the next morning, when he took the bus home, his fedora in his suitcase. As Winnie made him chicken-foot soup that afternoon, the house was quiet. She set the table with bowls that had belonged to Guinea-woman, Murlina. “Your passage soon come,” she said. After that, Hector took in more and more sewing and began to pedal his way to a far off place only he could see. Sometimes when he sewed on his beautiful black machine, he was taken so far away that when Gran-Win called, he could barely hear her. He sewed through hurricane, through hogs in labour under the house, through visitations of dark moths, and Gran-Win’s praying; his beard gone natty dread-o. 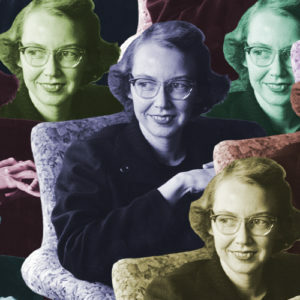 They say my mother, Vaughn, was born at a neighbour’s house across the hill on a night when the moon had been eaten up and Hector stayed home to sew. Later, on his way to see his new daughter, he heard the news that Garvey had moved to London, his Zion dream unsupported. It was when Garvey died, and on a day that Hector had come back from his usual trip to the post office, that he disappeared—both he and the sewing machine. He had been such a quiet man, no one understood why he would leave. One day, many years later, Gran-Winnie would tell me that Hector ran off with a one-foot woman, Millicent, black as the Ace of Spades. From The Marvellous Equations of the Dread. Used with permission of New Directions Publishing. Copyright © 2018 by Marcia Douglas.